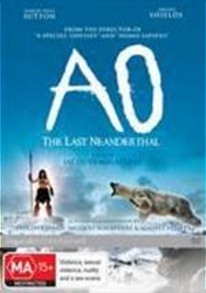 AO the Last Neanderthal DVD Review There aren’t any profound revelations or happy endings in the story of Ao. This is a stark, candid, sometimes moving look at our very early history. Humans - what a mean and nasty sort. In French director Jacques Malaterre’s portrayal of our pre-history, early humans are depicted in a savage and honest light. Not content with driving the last remnants of the Neanderthal race into the frozen waste of northern Europe, they then set out to isolate and destroy the remaining groups, leaving not one man, woman or child alive. Homo Sapiens-yours and my ancestors- are very much the antagonists in this story. Having narrowly survived the slaughter of his tribe, the titular Ao (Simon Paul Sutton) struggles south in search of warmer climes. He is driven by memories of his childhood, and specifically his brother Oa, who he hears and sees through a series of visions throughout his journey. But during this trek Ao is caught and imprisoned by a tribe of homo-sapien warriors, who plan to sacrifice him to their deities. Using his primitive cunning and brute strength Ao manages to escape, along with a human girl named Aki (Aruna Shields.) When Aki gives birth, Ao starts to regard the child as his own murdered daughter and steals her for himself. But he soon realises that he and baby Wama won’t make it far unless they have Aki’s milk. What starts out as open hostility between Ao and Aki slowly begins to mellow. Bound by a mutual fascination, the two continue the journey together in search of Ao’s promised land. While it presents itself as a documentary, ‘The last Neanderthal’ is told in narrative form. Narration is provided by Ao, and later on Aki, but most of the dialogue in the film passes without translation, as if we really are watching ancient humans fighting and performing their rituals. In a semi-documentary of this nature, it was always going to be a fine line between displaying the harsh realities of the time period and having characters we could still relate to. ‘Ao’ gets this just about spot-on. The story pulls no punches with its savagery and brutality, yet there are also some finer, subtler moments to remind us that these animalistic characters are still essentially human. Both of the lead actors do a great job of bringing this world to life; Sutton’s blue-eyed portrayal of Ao is full of wonder and child-like frustration. It’s the interplay between Ao and Aki that makes this feature film- the clash of personalities, ideals and motivations is always at the forefront. The only thing that hurts believability is the fact that the Neanderthals here aren’t that much bigger or bulkier than the ‘humans’ they share the film with. While the bulky nose and high, thick brow line do make Ao look primitive and savage to a degree, it would have been nice to have more of a visual contrast between the two races. Perhaps someone of greater stature, with a more imposing physical presence, would have been better suited to the role of Ao. There is one, albeit crucial, lapse in the provision of subtitles for this French-speaking film; there isn’t any English translation for the final paragraph of text, the one that is supposed to tie the story together. It’s not a complete deal breaker but it does leave you slightly baffled. I do have a French phrase book here somewhere, but I wasn’t willing to pause the movie on my plasma screen while I excavated it from the mess in my study. There aren’t any profound revelations or happy endings in the story of Ao. This is a stark, candid, sometimes moving look at our very early history. The ending leaves you feeling a little deflated (unless something truly inspiring or poignant was contained in that last block of French) but I still wouldn’t hesitate to recommend it if you’re interested in the subject matter.